The showdown between No. 1 Bishop Carroll and No. 2 Wichita Heights turned out to be a mismatch and left many wondering if there are any legitimate challengers to the Golden Eagles in Class 5A. After giving up an early safety on an errant punt snap, the Golden Eagles score nine consecutive touchdowns to rout Heights 70-15. Carroll quarterback Colton Howell passed for three touchdowns and rushed for two more in helping his team to a 42-2 halftime lead. Denzel Goolsby scored five consecutive touchdowns spanning the second and third quarters. He finished with 131 yards rushing and three touchdowns and also caught a pair of touchdown passes. Howell passed for more than 150 yards and rushing for just shy of 100 yards on the night. The Eagle defense held Heights to around 60 yards rushing on the night. In the Fan’s Choice for Kpreps Game of the Week also turned out to be lopsided as Southeast of Saline routed Class 2-1A No. 1 La Crosse 40-6. The loss stopped the Leopards 39-game regular season winning streak. Cody Schlesener rushed for a pair of touchdowns, threw a touchdown pass, and returned an interception for another score to lead the Trojans. La Crosse will try and rebound against Ellis next week, while Southeast of Saline remains unbeaten on the season and will host powerful Beloit. The Eastern Kansas League game of the week ended with a Bishop Miege 37-20 victory over St. Thomas Aquinas. Miege quarterback Ryan Willis tossed a pair of touchdown passes to Dawson Downing to expand a 9-0 lead into a 23-6 lead. Willis also hit Danny Murphy on another scores as the Stags led 37-13 in the fourth quarter. The Stags continue through the EKL gauntlet next week when they host Blue Valley West (3-1). Aquinas will try and rebound from its first loss by traveling to winless Gardner-Edgerton. After being locked in a shootout early, Topeka High blitzed Emporia 63-21. The Trojans scored touchdowns on their first seven possessions in building a 49-21 halftime lead. Quarterback Alec Beatty scored his sixth touchdown of the game in the third quarter as Topeka built its lead to 56-21. The Trojans, ranked No. 3 in Class 6A, will travel to Topeka Seaman next week. In the Friday Night Live game presented by Cox Channel Kansas, Derby held off Hutchinson 35-28. The Panthers once led 35-7 before the Salt Hawks rallied for three fourth-quarter scores pull within the final margin with just over two minutes remaining. Curtis Whitten rushed for nearly 100 yards and scored three touchdowns to lead Derby. Hutchinson’s Blaik Middleton rushed for 156 yards on the night and Turner Wintz rushed for a pair of scores and passed for another. Meade edged Cimarron 12-6 to take control of the Hi-Plains League race yet again. The Buffaloes broke a 6-6 halftime tie with a touchdown early in the third quarter and then held on for the win. Staying in the southwest portion of the state, Ulysses blasted Colby 62-13 behind another outstanding performance from all-state running back Ian Rudzik. Rudzik carried only eight times in the game, but amassed 244 yards and six touchdowns. Abilene got a key North Central Kansas League win by holding of 4A-II No.5 Wamego, 25-14. The Cowboys led 13-7 when Wamego quarterback Kyler Alderson was intercepted in the end zone to turn away a Red Raider scoring threat. It was Alderson’s third interception of the game. Abilene would extend its lead to 25-7 before holding on for the 11-point win. Class 3A’s No. 3 team Scott City routed the No. 4 team in Class 4A-II, Holcomb 49-6 on Friday night. The Beavers forced five Holcomb turnovers in the first half alone to build a 36-0 lead and put the game out of reach. Trey O’Neil threw four touchdown passes on the night as part of his 225-yard night. Fort Scott scored a touchdown with 22 seconds remaining to slip by Coffeyville 46-42. Carter Young then sealed the game for the Tigers with an interception on Coffeyville’s final drive. The Tigers got more than 130 yards rushing and three touchdowns from Chase Brown. LaDarrius Johnson was spectacular for Coffeyville. The senior rushed for more than 230 yards and two touchdowns, caught a touchdown pass, and threw a touchdown pass in the game. Two good battles in the CNC League resulted in close games. Frontenac remained unbeaten with a solid 30-26 win over Galena. The Raiders held the Bulldogs on a fourth-and-goal from the 2-yard line in the second half for what would have been the winning score. Galena, which began the season ranked fifth in Class 3A, fell to 1-3 with the loss. The Bulldogs’ three losses have come to three undefeated teams in Columbus, St. Mary’s Colgan, and Frontenac. Colgan remained undefeated despite struggling at Southeast-Cherokee. The Panthers overcame five turnovers to escape with a 19-18 win. Top-ranked Chetopa proved they’re worthy of that designation by passing what will likely be their only regular-season test with a 56-8 win at Uniontown. 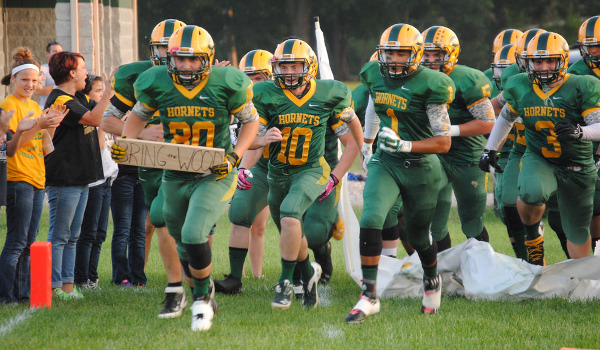 The Green Hornets led 36-8 at halftime before putting the game away mid-way through the third quarter. Uniontown, which rushed for more than 450 yards a week ago, was held to around 110 yards of total offense on more than 50 offensive snaps. Finally, how can we not mention the incredible scoring that took place in the Central Prairie League on Friday night. Otis-Bison outscored Kinsley 104-70 behind a huge night from Brad Lightfoot. All Lightfoot did was amass more than 415 yards of total offense and score 10 touchdowns in the game.